Inspired by some fun cards Julie Ebersole recently posted. Love her light fresh look! Not sure I quite got the look, but it's cute anyway. Stamps from Impress Flower Power, inks are Distress Oxide (amazing coverage). MOOD WHEN DONE = Excited. The husband is coming home (today Saturday), after being on travel for work for 5 days (including a travel delay). Apparently I need him. HA! I think you DID achieve the same look the lovely Julie creates; I saw your card and had to double check I had clicked on your blog NOT hers!! 😁 The two of you are side by side in my bookmark list. Beautiful card. Cute, cute! 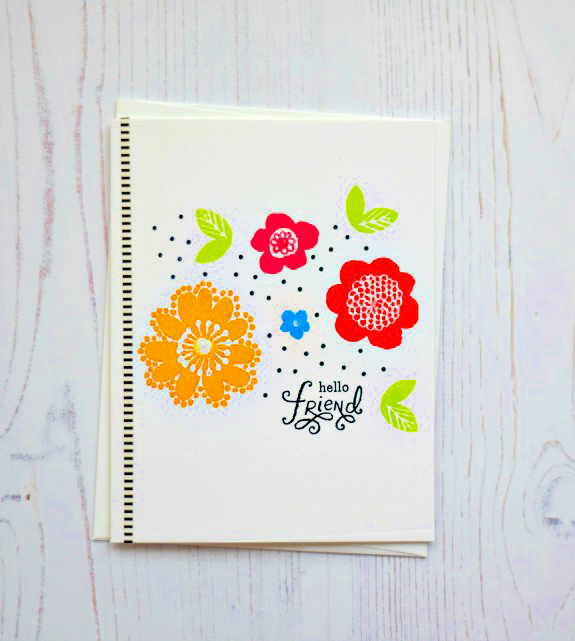 There's nothing like bright, colorful, and whimsical for a happy card. I absolutely love this! It is bright, cheery, and happy! As soon as I saw this I thought to myself, "This is very Julie Ebersole-ish!" This is so pretty, Joan!